This sleeveless dress features a lace overlay that extends to the back body seam. The dress is made up of different panels and cut with an angled / stepped hemline. A patched pocket bag hangs from the wearer’s right front seam. The neck edge has a long scarf (with a lace panel section) which is attached to the back neck and can be styled in many different ways. 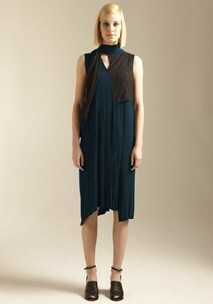 This dress has been garment washed to give the fabrics a more textural effect and to provide easy care. This style is true to size, the cut is designed to skim over the body, and it is a relaxed fit through the waist and hips. Viscose | Cotton | Nylon | Gentle Hand Wash | Manufactured in Melbourne, Australia.